There’s another game in the app store that got me excited. I am very proud and happy to share that this game was developed and released by a fellow Filipino, Erick Garayblas of Kuyi Mobile. Yep, this is proudly Pinoy made. 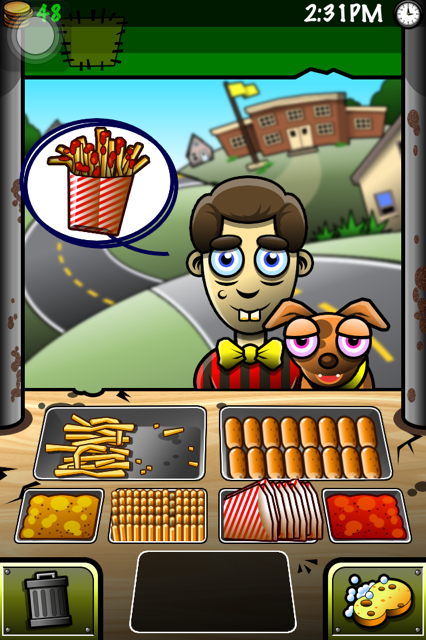 It is aptly titled Streetfood Tycoon. As we all know, this type of food is very much popular here in the Philippines as this can be seen almost everywhere. 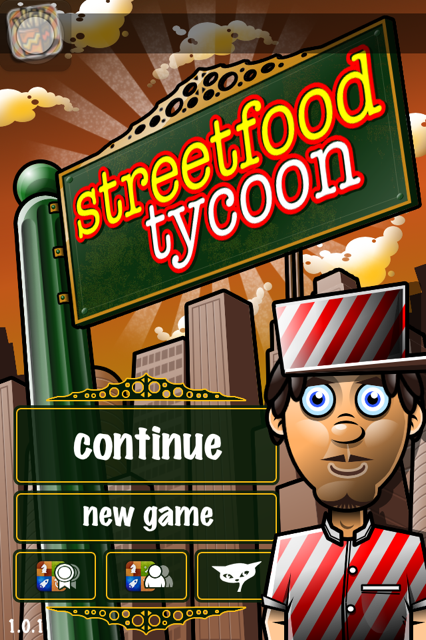 Streetfood Tycoon is an iphone game application that can be downloaded for free from the Itunes App Store. 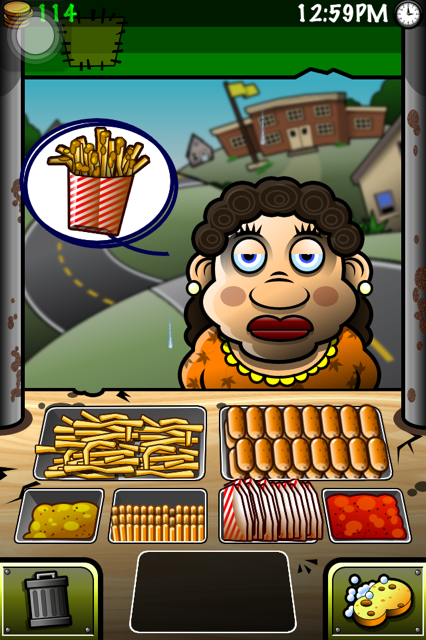 It is a management game where you have to fill in the customer’s order by combining the right ingredients while at the same time dealing with restocking, buying better ingredients and upgrading facilities. The game is easy to play. 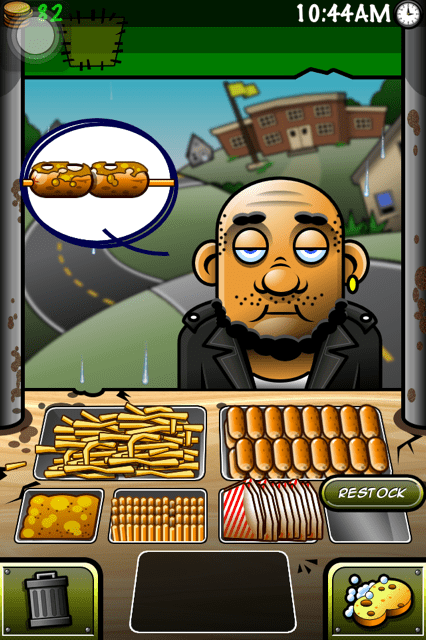 The main objective is to earn enough coins by selling food. When a customer approaches the cart they will tell you their order through a picture bubble. You just need to tap all the ingredients as shown correctly in the picture to create an order. You then need to drag the order to the customer to complete the sale. In case you mess up and want to start over, you can tap the trash at the bottom left side of the screen to scrap your previous creation. There’s a time limit for every order, if you don’t respond right away, the customer will not accept the order and leave in a huff. There are also those little things like stocks running low, food spills, and left over crumbs that need cleaning-up that had to be addressed right away to avoid getting into a fix. You can only restock one item at a time, so you need to make quick decisions too based on what your business needs at the moment. As you progresses in the game, you’ll be able to move to 4 new locations. 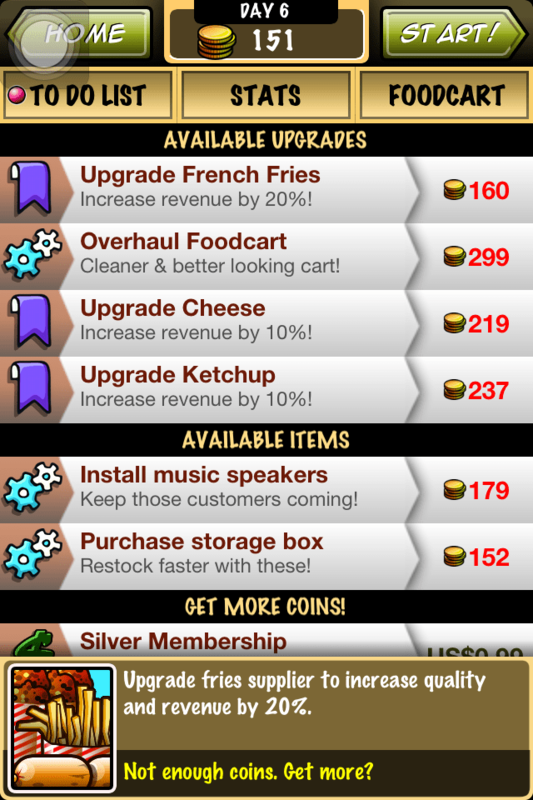 You will also be able to upgrade your cart to serve more and better quality food (aside from corn dog and fries) such as kwek kwek and fishballs. Visually, the background is pleasing enough to the eyes. It has a dreamy quality to it as it appears washed up. What I like most about this application is the cart itself. I love how the food are graphically presented. When you fill in orders you can see the food supply being reduced and when you restock, you can actually see it getting refilled. I like the animations too such as the musical notes and tipping jar. The character graphics though can still be improved as some have very sharp features. It would be better if they can make the features of the ladies appear softer and tone down the features of the men a bit too to make them look more friendly. Since this game can be played by not just adults but children and teens as well, it would be good to make them more attractive and less intimidating. The sound effects are on the mediocre side. It doesn’t do much to the game itself. In fact, it wouldn’t hurt to change this into a more lively and catchy tune to pump up playing time. The character responses are repetitive too, it is kind of funny the way a macho guy would suddenly let out a whiny “bye” or how an old lady would suddenly emit a manly growl before she leaves. I highly recommend this to anyone who is interested in putting up her own food cart business or basically those who want to have some fun playing streetfood vendor. This is a good way of putting into practice the business skills you have acquired. It provides a venue where you can exercise your skill in making hard and fast decisions, managing finances well, increasing customer satisfaction, balancing restocking, and observing good sanitation. With parental guidance, children aged 7 onwards and teens can easily enjoy the challenge of earning, spending and saving as nothing comes here for free. 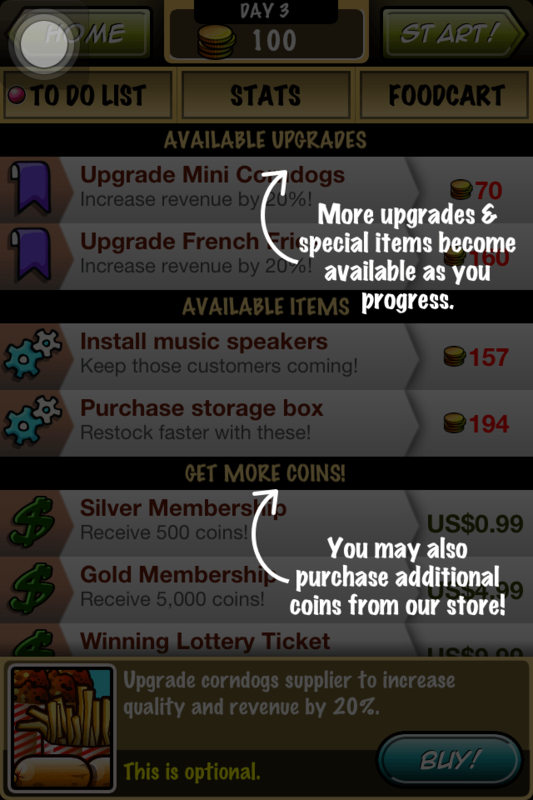 Everything has to be purchased with coins. Playing this game with your children is a good way of teaching them the value of handling money wisely and working your way up. Overall, this is a great game to play. It is both fun and addicting. This game provides enough challenges that would make you want to play it again and again. 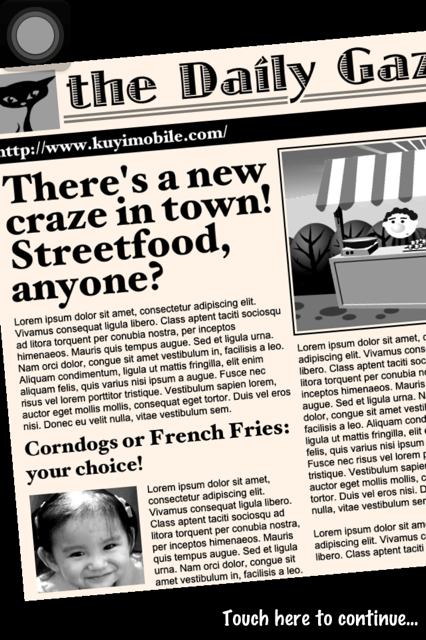 With streetfood tycoon, you can be the savvy streetfood vendor in no time. Somehow, it exercises your brain to do more than flick your finger on the screen, it gets your mind working while you’re having fun. ..feeling ko this could be one new addiction..hahaha..cool game! I got to the kwek-kwek level already! 🙂 It’s addicting! coolness! And by a fellow pinoy! galing! I am addicted to this! I love this game so much! I already served Lady Googah, Pee Noy and Mooney Pookyaw! Hahaha, this is so fun! Proudly Pinoy made pa.
to say about this paragraph, in my view its actually awesome in favor of me. I’m amazed, I have to admit. Seldom do I come across a blog that’s equally educative and interesting, and without a doubt, you’ve hit the nail on the head. Great informative article. Your posts are so interesting and providing me great information. thanks for the shearing. Keep shearing bro….